Discussion in 'Other Brands' started by sonichedgehog360, Apr 9, 2017. The Eve V is where community meets innovation, a potentially colossal step forward from the popular Surface Pro 4 aiming for the lofty goal of "the world's first crowd-designed computer." The similarities are hard to ignore between it, the Surface Pro 4 m3, and the ASUS Transformer 3 Pro. The Eve V is also especially low-priced considering the plethora of expandability and impressive feature set it brings to the table, much of which will immediately catch the seasoned tablet PC aficionado's eye. 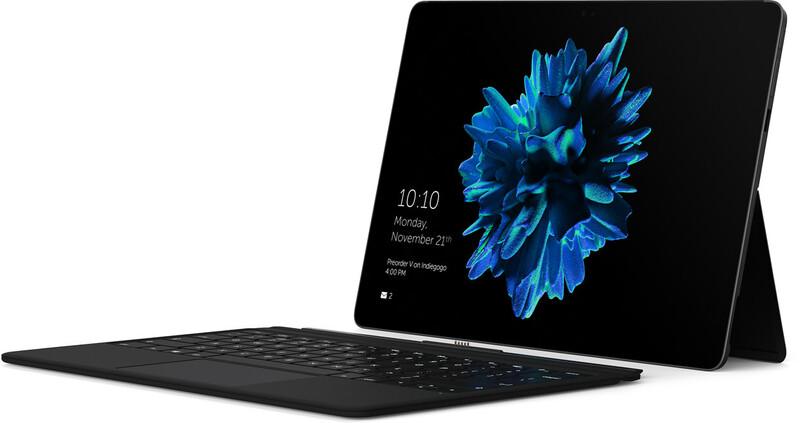 Standout features include: LTE version, 8 GB RAM standard, 48 Wh battery, 2 full-size USB ports, 2 USB-C ports including one with full Thunderbolt 3, Surface Pro 4 display and PixelSense digitizer. In a series of three rounds confirming the specs, I'm absolutely thrilled to be able to confirm the last round of the V's features & specifications. Without further adue, let's get down to business. I'll also break down the thinking, process and shed some light on the details of the specs that were not published earlier. "what does it really mean to have all day battery life"? We know that for many companies, it unfortunately means just writing that to their web page without any real possibility of ever achieving that. By those standards we would have two-three-day battery life. Its the capacity that matters. But simultaneously people wanted slimness! "make a slim and lightweight device with tremendous battery life! As unfortunate as it is, we are (and were) not in possession of game-changing battery technology. To get set things straight, we had to pull off some remarkable and innovative engineering, but in our hearts we knew the answer to the age-old "how long" -question for us was: 10-12 hours of continuous use. Extending the thickness a little bit gave us also the possibility to factor in the USB A ports. To achieve the high performance requirements, we designed Eve V's interiors to hide in a high capacity battery, totaling 48 lithium-ion powered watt hours. That's over 20% more capacity than Surface Pro 4 or Macbook 12. And roughly the same as the new Macbook Pro. By our calculations this by itself should power the V for 10-12 hours of light browsing, writing emails, watching some youtube here and there - etc. We wanted to be absolutely sure the battery life would be tremendous. We didn't want to let you guys down, so we contacted a software house, having its roots coincidentally in a Microsoft incubator, to build us custom algorithms, enabling smart power management. System efficiency can also play an important role in achieving great battery life. We're comfortable in promising the V 10-12 hours of REAL battery life under normal usage scenarios. Are you happy with the battery life? Let's show those macbook users we got battery life too, huh?!? Please remember guys that you won't get this battery life with all sorts of usage. The battery life varies on multiple factors, such as whether you use CPU heavy programs, listen to music at max volume, have the display brightness at maximum and so on.. The community wanted a sturdy, well built keyboard that has decent amount of key travel. Additionally we were instructed to get the best track pad possible. Having the community's instructions under our belts and typing ourselves every day, we knew we needed to make it count. Going to the design of the keyboard our goal was to liberate the typing experience. We wanted The V's customers to enjoy a precise, noiseless and ergonomic method of input. To achieve this, we started by designing a durable and sturdy, premium build. A little thickness was added, to enable a variety of features (read onwards to discover them) and make the structure sturdier. Under the fabric surface, precision enhancing scissor mechanisms were built beneath each key. Offering an actuation force of ca. 55 grams, combined to 1,3mm of travel distance the typing should be a splendid effort! Each high quality polycarbonate key is coated with high quality dark paint, after which the characters are laser etched on the surface. We knew many people were disappointed in track pads within most Windows PCs. That's why we chose the most precise track pad available. We improved the touch interface even further by a lamination of low friction yet highly conductive surface glass material. The V's track pad is Windows precision touch pad certified. Gestures and multitouch are naturally supported. Yes. Actually we have more than one. The module we use supports multiple different colors. Yes they are adjustable as well. All the usual stuff. What may come as surprising fact, was that the slim back light module is actually quite an expensive part. Perhaps that's why its not included in so many devices.. Although the community didn't unanimously want a wireless keyboard, I wasn't willing to let it go since it is such a cool feature. You'll all see when you try it! Only a wireless keyboard would solve majority of the lappability issues some users are wary of and free your working positions in the most comprehensive manner. But don't worry, it also works with pogo pins! The V keyboard connects automatically to the V computer within seconds of being detached. Correspondingly, the wireless connection is automatically disconnected when the keyboard is connected through the pogo pins. Charging the keyboard's internal battery is initiated simultaneously. The V keyboard can pair up to three different bluetooth devices. Switching between them is done with designated key combinations (no ugly looking extra buttons). The V keyboard's internal battery can power more than a 15 hour-hackathon of continuous typing without backlights and 3 hours with back lights. The V Keyboard's structure is designed so that two different materials / colors can be used on the sides. This means future upgradeable materials / colors are a real possibility! Should you choose to go wireless, each input is carried securely over Bluetooth 4.2 transmitted radio frequencies. Yes I know, I promised proprietary RF communications at first. My mind was then changed when I learned we can have bluetooth 4.2. Bluetooth would enable the V Wireless Keyboard to work with more devices than just the V.
Is it even possible to make it better? We received some material / finish concepts from our designers a few weeks ago, it just so happened that the first one - the one we also liked the most - had Alcantara fabric on it. Two days later, Microsoft announced the Alcantara Signature Type Cover. Well I anyways called Alcantara last thursday, since it didn't make sense to drop it just because someone made it first. Well on Friday (the next day) the samples came to our office and OH MY GOD. The suede feeling on it is just somehow absolutely magical. It feels sooo good. I just couldn't stop touching it! I'm definitely getting one. Compared to a standard microfiber e.g. on Surface type cover, the difference is like night and day. It also just happens to be approximately 7 times more durable than standard fabrics That makes it nearly unscratchable. As such, it'll wear time much better. Would you also be interested in getting an Alcantara upgrade for your V Wireless Keyboard to make it absolutely perfect? How much do would you be willing to pay to get this upgrade? (Remember the V keyboard is included in the prices, but the Alcantara is not. Does the V Wireless Keyboard sound like a cool product? OK OK our benchmark here may be so high that I'm not willing to guarantee you'll be successful in all scenarios but after checking what we've included, I think you'll believe we tried ! A close up of Eve V's speakers. So what can you expect to come out of the holes seen above? Well typically speakers in this category are a pair of them with 0,5 watts in output power each. As you may remember from the advisory specs, we promised you dual speakers or better. Two was not just enough. That's why we included four. So yes, we do have quad speakers. Not only we doubled the standard amount, we wanted to make sure you don't have to max out the speakers out any time you need to hear something. That's why we also doubled up on the watts. In total, the V will have 4 watts of speaker power (that's nearly as much as our CPU can drain). The V will be able to make some noise but it's gonna cost you some battery life. Don't worry, you don't have to drive these babies at full volume to hear something! We didn't skimp out in the quality either. The V's speakers are manufactured in high tier facilities and were chosen based on the quality, not the cost. Some of us have high quality headphones that need a bit more power. While some companies are getting rid of the headphone jack altogether, we went the opposite way. We in fact had to redesign the whole port. This was partly to enable V's design goals with the steep cut side edge. Design goals apart, audiophiles won't be disappointed to hear that we've also included a dedicated amplifier specifically for the headphone jack. This will drive the connected audio device with up to 5x greater performance vs. e.g. Surface Pro 4's headphone jack. To make your communications experience complete, the V will ship with two high end microphones that have noise cancellation capabilities. The V's microphones are able to filter out annoying back ground noise and register your voice from further away than typically possible. The community was very clear about not over spending in the cameras.25 Most of us already carry around our smartphone with clearly better cameras anyway. Simultaneously, though, it became also clear it would be nice to have some basic cameras. As conclusion the V's cameras will be the only spec where we are not going to over deliver, as per the community's request and will be industry standard 2MP on the front and 5MP on the back. That being said, we are including the best image sensors and lenses for the mega pixels that were possible for us. The V will finally ship with Windows 10 Home edition. We are also discussing with Microsoft whether users could choose at our web store to upgrade to Windows 10 Pro. And currently it seems it could very well be possible. At the moment we can't confirm nor deny possibility of the V supporting any particular version of Linux and we only guarantee it works with Windows. That being said, we do not oppose anyone trying their luck in installing Linux (I know we have members here who intend to try). Such trials will not result in void warranty. But if something goes wrong, our support will not be free either. In time, once more resources become available to us, we intend to support Linux to the best of our abilities. We just could not jeopardize the development of the best windows machine to support Linux. A good device intended to be your daily driver needs a proper warranty. I didn't feel 12 months would be justifiable with a device as high end as this, so we decided to double the warranty to 24 months for all configurations. This won't affect the final price of the product. As said before, we will also help the owners of Vs in case accidental damage occurs by providing our warranty repair resources for non-warranty-covered accidents as well. That means if you break your device, for a reasonable fee, we will repair it for you! These were the final confirmed specs of the world's first crowd-designed computer. I think we did wonderful job guys! Thank you all for participating! See how Eve V Compares to Surface Pro 4! Is there an LTE model coming? Do we get GPS? Yes, we're working on an LTE model for the V at this moment. The LTE version will for sure feature GPS. We might put GPS into the normal V as well, depending on how well it performs in the regular casing, so no promises there. All the specs have been mentioned here70 and below are the only differences you'll find between the models. Live at 4 P.M +2 GMT. Shipping $30, taxes included. All configurations eligible. Shipping $119, import charges & taxes included. All configurations eligible. Shipping $50, local taxes, duties & charges may apply. All configurations eligible. Applies only to a preinstalled copy on Eve V.
This is the first of many future supply-chain posts and I'm super excited to have my first official post! In the spirit of community-driven everything here at Eve…. I need YOUR help to help me develop our V support process and warranty card. We will manufacture the V, package it and get it shipped to dedicated fulfillment centers around the world so that it can be efficiently shipped to end-customers. But what happens once we ship out the V? Things can break, devices can malfunction and we will need to support those that experience that. So here are our thoughts on how we manage this. Eve provides a warranty for the V. If a customer receives a malfunctioning device, then we will ship a device at the same specs as fast as possible to the customer. Customer can then ship the faulty V back to the manufacturer for repair at no cost to them. If the device has software issues then we can troubleshoot within the community, cause quite frankly eve.community is much faster than a lot of "professional services". Now…here is the question. What should we do if a screen is broken, a kickstand falls apart or a device is dropped and requires repairs? What is the best, most efficient and cost-friendly method? We've brainstormed a few of ideas and wanted your vote! Eve Repairs @ Factory: The traditional method would be for the customer to send the device to Eve, we analyze the situation and send it to the factory (all the way in China) for repairs. This process is typically lengthy and the factory may not give repairs first priority. On the plus side, they will be more equipped to repairing the device (since they made it) and would have the parts handy. Outsourced Service Center: We can search for service centers (or better yet…you can recommend us some) and partner up with them to repair the V. Customers will ship the V to them to get it fixed. We will provide these service centers with the parts and instructions on how to fix the V.
DIY: Our customers are tech-savvy and quite skilled at fixing devices. What if you tell us what you need, we ship you the components and you fix it yourself? This is assuming you know what is broken and what needs to be fixed of course! Community Repair Center: Our community is full of gems. We have highly technical individuals that are capable of repairing devices. What if we had select individuals from the community to fix our V issues? Of course, Eve would send over the components. The V would be made by the community and fixed by the community. Of course, on the back-end we will set up a DHL account for V support purposes and map out the process based on what the community votes for! Cost incurred will either be paid by Eve (warranty cases), split by both parties, or paid by the customers (repair scenarios). We will brainstorm as a community on what the best approach is! We don't anticipate many issues since all V devices will be tested for quality control before shipping. But stuff happens. We have to include some legal stuff to clarify what is and isn't covered by warranty. Here is what the lawyer came up with (Please note: 1-year warranty is a standard factory warranty, but all Indiegogo buyers will receive 2-years warranty for being our first supporters and deserve extra perks ). (iv)EVE may use rebuilt, reconditioned or new parts and components when repairing any product. Alternatively, we may replace the defective product entirely with a rebuilt, reconditioned or new EVE product. This Warranty does not apply to any non-EVE branded hardware products or any software, even if packaged or sold with EVE hardware. Manufacturers, suppliers, or publishers, other than EVE, may provide their own warranties to you – please contact them for further information. Software distributed by EVE with or without the EVE brand (including, but not limited to system software) is not covered by this Warranty. EVE does not warrant that the operation of the EVE Product will be uninterrupted or error-free. EVE is not responsible for damage arising from failure to follow instructions relating to the EVE Product’s use. This Warranty does not apply: (a) to consumable parts, such as batteries or protective coatings that are designed to diminish over time, unless failure has occurred due to a defect in materials or workmanship; (b) to cosmetic damage, including but not limited to scratches, dents and broken plastic on ports unless failure has occurred due to a defect in materials or workmanship; (c) to damage caused by use with a third party component or product that does not meet the EVE Product’s specifications ; (d) to damage caused by accident, abuse, misuse, fire, liquid contact, earthquake or other external cause; (e) to damage caused by operating the EVE Product outside instructions. (f) to damage caused by service (including upgrades and expansions) performed by anyone who is not a representative of EVE ; (g) to an EVE Product that has been modified to alter functionality or capability without the written permission of EVE; (h) to defects caused by normal wear and tear or otherwise due to the normal aging of the EVE Product; (i) if any serial number has been removed or defaced from the EVE Product; or (j) if EVE receives information from relevant public authorities that the product has been stolen or if you are unable to deactivate passcode-enabled or other security measures designed to prevent unauthorized access to the EVE Product, and you cannot prove in any way that you are the authorized user of the product (eg. by presenting proof of purchase). CUSTOMERS SHOULD MAKE PERIODIC BACKUP COPIES OF THE INFORMATION CONTAINED ON THE EVE PRODUCT STORAGE MEDIA TO PROTECT THE CONTENTS AND AS A PRECAUTION AGAINST POSSIBLE OPERATIONAL FAILURES. Before receiving warranty service, EVE or its agents may require that you furnish proof of purchase details, respond to questions designed to assist with diagnosing potential issues and follow EVE's procedures for obtaining warranty service. Before submitting your EVE Product for warranty service you should maintain a separate backup copy of the contents of its storage media, remove all personal information that you want to protect and disable all security passwords. DURING WARRANTY SERVICE THE CONTENTS OF THE STORAGE MEDIA WILL BE DELETED AND REFORMATTED. EVE AND ITS AGENTS ARE NOT RESPONSIBLE FOR ANY LOSS OF SOFTWARE PROGRAMS, DATA OR OTHER INFORMATION CONTAINED ON THE STORAGE MEDIA OR ANY OTHER PART OF THE EVE PRODUCT SERVICED. Following warranty service your' EVE Product or a replacement device will be returned to you as your' EVE Product was configured when originally purchased, subject to applicable updates. EVE may install system software updates as part of warranty service that will prevent the EVE Product from reverting to an earlier version of the system software. Third party applications installed on the EVE Product may not be compatible or work with the EVE Product as a result of the system software update. You will be responsible for reinstalling all other software programs, data and information. Recovery and reinstallation of other software programs, data and information are not covered under this Warranty. Important: Do not open the EVE Product. Opening the EVE Product may cause damage that is not covered by this Warranty. Only EVE should perform service on this EVE Product. What do you think about this warranty card? We want to work with the community to define what is and isn't covered by warranty as legal jargon can be quite vague. Also, we want to know what the community thinks will be consistent repair cases so we can prepare for those scenarios! Here are some preliminary thoughts of repair scenarios based on prototype experiences! What else can happen to the V? We want to make sure we're prepared to fix the V if the situation arises. Just to summarize, I will be dividing this into 2 parts; the V support process based on what community votes for and our crowd-developed warranty card so we can define what is and isn't covered and key repair situations we need to prepare for. Can't wait to hear what you all think! What provisions have been made for warranty claims? Who delivers warranty services repair/replace? Is there any warranty? Here's my take. Adding some info to this question. Having sold T1 has taught us a lot and that's why our return / warranty processes are now going to be even better than what they were with T1. 3) you pay the cost of shipping both ways and get the non-warranty covered non-repaired unit returned back to you. In addition to that, our previous experiences have taught us to calculate the price of the unit so that returns and defects are factored in the price of the product. Customer satisfaction and happiness is a very important thing for us. Why? Am I just saying it like all other companies? Nope. The reason is that even though right now we are a small brand, in the future we intend to be bigger. And that can only happen if we have loyal customers that value our efforts. We truly believe that there is demand for a fair & an honest brand where the only "added value" you're missing is actually the fact that you can't buy it from a retailer. Note of clarification. Unlike their FAQ says, their pen does indeed use batteries. Like all N-trig pens, this does require a battery, but like they say, it does not charge. This uses a single AAAA battery like the current Surface Pro 4 pen. As this accessory is optional and not included like their type cover is, you could buy the Surface Pro 4 pen or any N-trig pen for that matter and use it just the same on the Eve V.
If we can get enough people to vote and in favor of it in their forums, they will do it. Here is a link to some benchmarks. Officially hyped! @MobileTechReview and @surfaceproartist should each seriously consider getting their hands on a review unit. Ok, so it's time to find enough people here who want this to happen, in order to bring a collective demand to their forums. I personally vote for both! Surface Air, although my mix is really everything I need. And the same one in 8" ? FZelle and sonichedgehog360 like this. 8", 8GB RAM, SSD + Thunderbold3 ( or at least USB-C with Displayport ). And constructed that you just plug it into a dock and your workstation is ready.